Today we’d like to introduce you to Marla Barkoff, M.D. In 10th grade, my biology teacher brought a pig’s heart to class. After the class was dismissed, I stayed in the classroom for 3 hours and explored the heart. It was the most exquisite thing I had ever seen. In that moment, I knew I wanted to become a doctor. My love for Endocrinology, however, came as a surprise. I entered medical school expecting to specialize in Infectious Disease. I had been living in Africa, studying Hepatitis B, and I believed that tropical medicine was my calling. But in my last year of medical school, a clinical rotation in Infectious Disease proved to be less than inspiring. I was forced to rethink my calling! I decided to participate in an Endocrinology elective, and the attending physician happened to be a thyroid specialist. I absolutely fell in love with thyroid physiology, but didn’t know how I could combine my new-found fascination with the thyroid and my desire to incorporate international health concerns. I was introduced to the global plight of iodine deficiency, which impacts fetal thyroid function and results in permanently impaired brain development. I travelled back to Africa to work with UNICEF on an iodine supplementation initiative which solidified me dedicating my career to thyroid health. My struggles as a doctor began two years ago when I personally became ill. I had dedicated my career to solving medical mysteries and had extended my heart to my patients in their struggles. But when I became ill, I was not treated by the medical community in the manner I had hoped. I became the patient that doctors rolled their eyes at. When nobody could diagnose my debilitating symptoms, I was made to feel like I was crazy. My own medical colleagues didn’t even support me. I struggled with being a patient and a doctor. I struggled when traditional medical therapies failed me. When I reached beyond to other modalities of healing, I felt shunned by my physicians and colleagues again. Having fought so hard to heal myself, both with traditional and non-traditional therapies, it became clear that I would have to open my own medical practice in order to stay true to myself and my patients. In December 2016, I opened my own medical practice specializing in all aspects of thyroid health. Most of the patients who come to see me have spent years (decades!) struggling with autoimmune thyroid disease, notably Hashimoto’s thyroiditis and Graves’ disease. 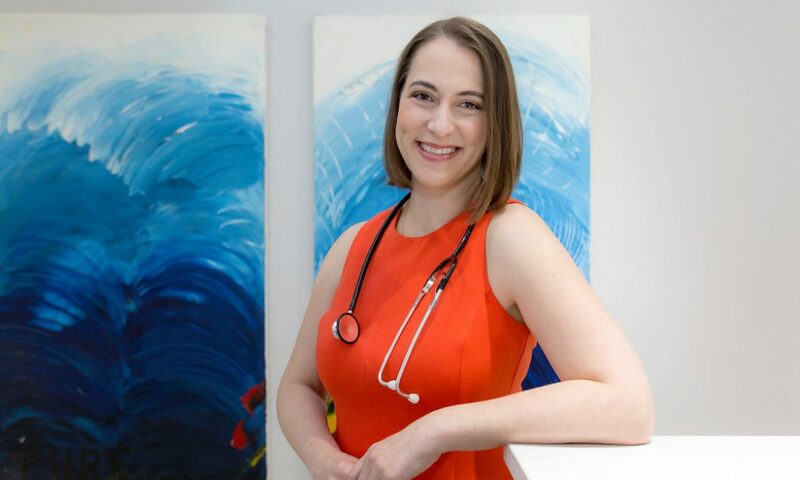 I also specialize in the role that thyroid balance plays in pregnancy, working closely with women who have experienced recurrent miscarriages or infertility. I have a unique appreciation for thyroid disorders as I have Graves’ disease myself. Suffering from thyroid disease myself has allowed me to personally appreciate the challenges my patients face. My practice focuses on quality of life in patients who suffer from thyroid disease. If a person continues to suffer despite normalizing thyroid health, I strongly believe there is another inflammatory process at play. In the past few years, I have begun recognizing the relationship between thyroid disease and immunologic mast cells. When mast cells become activated, patients experience worsened fatigue, brain fog, abdominal bloating, light-headedness, irritability/anxiety, and often hives. Diagnosing and treating Mast Cell Activation Syndrome in my patients with thyroid disease sets me apart from other Endocrinologists. I am most proud that I have built an office that my patients deserve. They are greeted with love and empathy. They are given a safe and supportive space to share their personal health journey. Hopefully, they will also find a place that provides them with hope. I believe that Chicago needs more outside-the-box medical thinking. Our great city would benefit from more traditional physicians recognizing that chronic autoimmune diseases often require more than traditional medicine in order to fully heal. I’m 52, I have been diagnosed with mast cell activation syndrome, hoshimotos , POTS, and more ? Can you see me as a patient? I’m from Missouri! Do you believe there is a relationship between the thyroid and the adrenal glands? Do you work with patients on this? Hello Dr. I have been diagnosed with metabolic syndrome, also have nodules on thyroid that have increased in size over past 5 years.. It seems I would benefit from a visit with you. Diabetic, high triglycerides, b/p, wt gain, inflammation, etc. Thank you. I don’t have a thyroid disease but MCAS, can I still make an appointment with you? I was diagnosed with Hashimoto’s 24 years ago. I was placed on synthyroid and that was a far as the treatment went. Recently I was told that I have low heart rate. I have had swelling in my left leg and fatigue. The current doctor switched my medication to Armour thyroid 60mg. However the symptoms persist. I am anxious and depressed at times without warning or obvious cause. I attribute these symptoms to poorly managed Hashimoto’s.